Bilberry is a plant that was used in World War II by British pilots in the Royal Air Force to improve eyesight and night vision. Bilberries contain anthocyanosides which have powerful antioxidants that support vision. 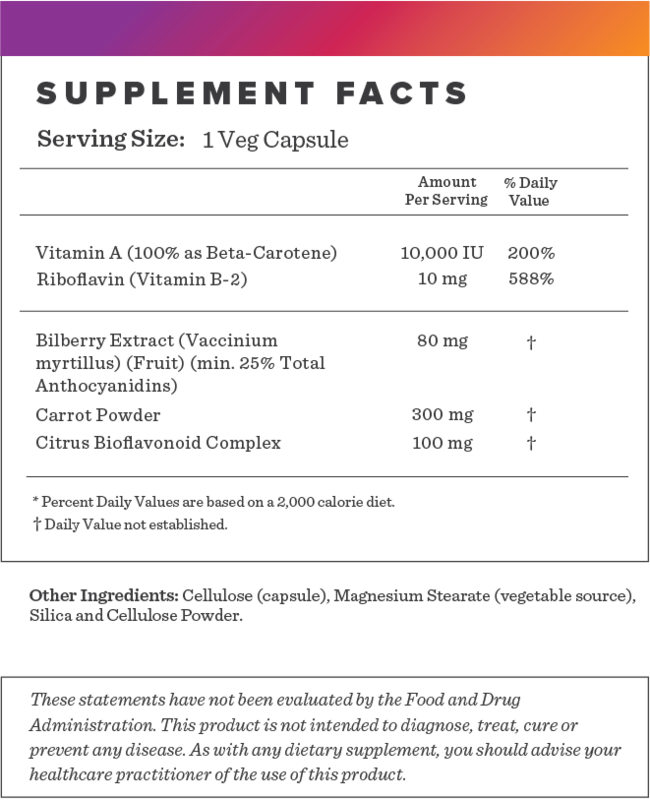 Our vegan-friendly capsule also contains carrot powder and citrus bioflavonoids with 10,000 IU of Vitamin A.
Bilberry is full of flavonoids that may fight oxidative stress while increasing circulation and supporting blood vessels in the retina. Research suggests supplementation may decrease eye fatigue and night blindness. 1. Ghosh D, Konishi T. Anthocyanins and anthocyanin-rich extracts: role in diabetes and eye function. Asia Pac J Clin Nutr. 2007;16(2):200-8. 2. Chu W, Cheung SCM, Lau RAW, et al. Bilberry (Vaccinium myrtillus L.) In: Benzie IFF, Wachtel-Galor S, editors. Herbal Medicine: Biomolecular and Clinical Aspects. 2nd edition. Boca Raton (FL): CRC Press/Taylor & Francis; 2011. Chapter 4. 3. Wang A, Han J, Jiang Y, Zhang D. Association of vitamin A and ß-carotene with risk for age-related cataract: a meta-analysis. Nutrition. 2014;30(10):1113-21. 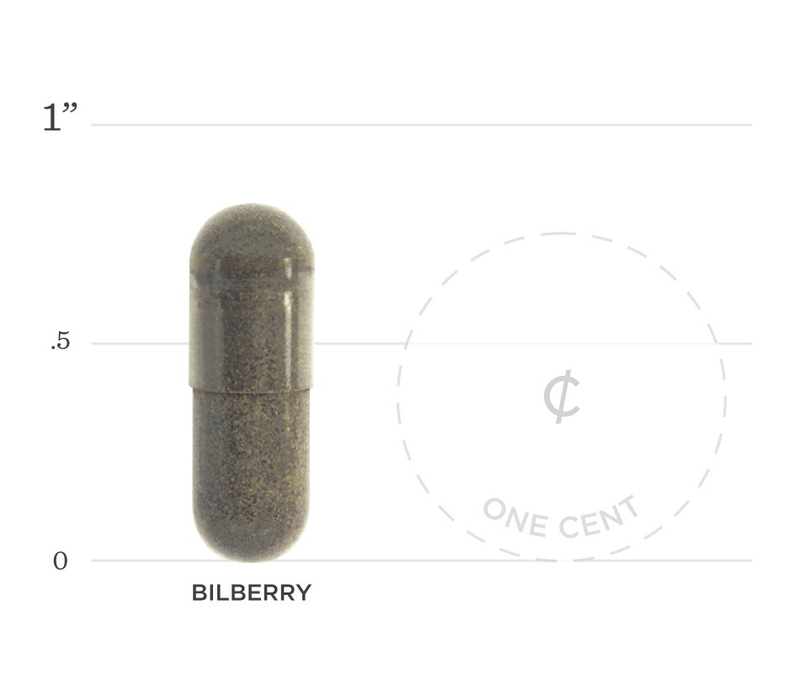 Below we've broken down the main functions of our Bilberry and the benefits it can provide. The anthocyanosides in bilberries contain antioxidants that may help protect the retina and prevent macular degeneration. Studies have found that bilberry is one of the richest sources of anthocyanins, which work as powerful antioxidants and are responsible for giving bilberry it’s dark color. Vitamin A protects the outside covering of the eye called the cornea. Research shows it can reduce the risk of macular degeneration, cataracts, and other eye conditions.